This year’s Compference (#Compference17), the modern compensation event for comp professionals, HR professionals and business leaders, is packed with educational sessions and actionable insights. 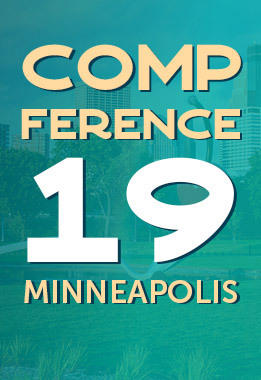 Compference is literally “an event with a playbook” — you’ll walk away from two days of jammin’ on comp and HR topics with specific ideas for how to implement your learnings and get comp right for your organization. Whether you’re new to compensation or just need more rigor around comp for your organization, this session will walk you through all the important steps of building a solid compensation plan. Kari Van Hoof, Compensation Professional II at PayScale, will help you tailor a comp strategy to match your company’s pay philosophy, review how to create a pay structure that reflects the strategy and detail how to implement your new comp policies and procedures in the broader organization. What are the connections between engagement, communication, performance and compensation? Find out in this enlightening session by Chris Martin, Lead Data Analyst at PayScale. Chris and his team have been gathering and studying new data on what impacts employee engagement, from company factors like size, geography and industry to workforce demographics like gender, generation and race. Chris will review the findings and provide attendees with actionable takeaways for improving engagement in their organizations. Having strong relationships across teams is critical for building an organization’s compensation strategy and getting it successfully implemented. HR pros at growing businesses know this especially well — a strong compensation plan is key to hiring and retaining top talent. In this session, Elisabeth Giammona, SHRM-CP, HR Manager at Agari will explain how you can establish yourself as an expert collaborator across HR disciplines with compensation. Don’t miss this educational mega-session. In what is sure to be an insightful discussion on a close-to-home topic, a panel of pros will chat about how the comp analyst role is changing and offer recommendations for going with the flow of disruption. Join Bob Shade, Sr. Manager, Compensation at NRECA; Emily Jensen, VP Customer Success at PayScale and Glenn Stroessner, Senior Compensation Consultant at Howard Hughes Medical Institute in this helpful talk on adapting your work to changing times. Like what you see? There’s more! Check out the full agenda. Got burning questions about compensation and can’t attend? Ask away in the comments.